One of the less popular types of nixie tubes are the bargraph display tubes. The part numbers are IN-9 and IN-13. What’s nice about these tubes is that you can get a continuous bargraph display — it makes a nice alternative to a discrete LED display. People have used them in VU meters and similar circuits. The IN-13 is the easier of the two tubes to drive, and it’s surprisingly simple. The hardest part is that you’ll need a good 150 VDC supply to power it. 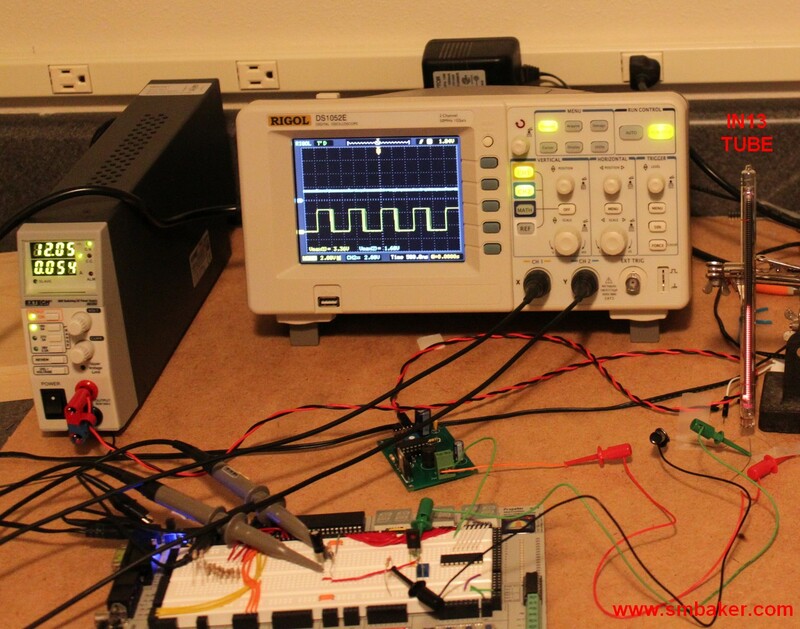 I build a little boost converter that runs off 12vdc to provide the 150 VDC. The control the indicator, a simple transistor driver is used using a MJE340 transistor, a resistor, and a pot. Could you please post your schematic and layout for the 150 V booster? Certainly! a new page is now up for the high voltage power supply. I am building a lamp and would like to have several of my in 13’s ramp up like your in 13 demo from 0 to full power and keep repeating. I am good at electronics projects but not at circuit design. I can get them lit up but not ramping on and off like yours. I’m assuming you used a pwm of some sort to accomplish this. Do you have the pwm circuit diagram somewhere on your site? Is the Voltage on the IND-Cathode 0V to 5V? And is the Nixie-Tube linear to this Voltage? If we use an arduino, we dont need R4 & C1 right? Since I believe there are analog outputs on the arduino. Hi, my names is Davide From Italy, I’ve built my IN-13 Thermometer, I use it for indoor temperature It’s switch-ON every days so IN-13 tube has poison cathode problem….I think because the IN-13 bar stay fix for a long time. How I can remove that problem? Hello, I just discovered your helpful circuit and will be forging ahead with it for at least a couple of projects that I have in mind. Has anything changed since you did this back in 2010, would you improve anything? What is the purpose of the trim-pot? I would be using an Arduino – probably a Nano as it has more than enough pwm outputs for the job.